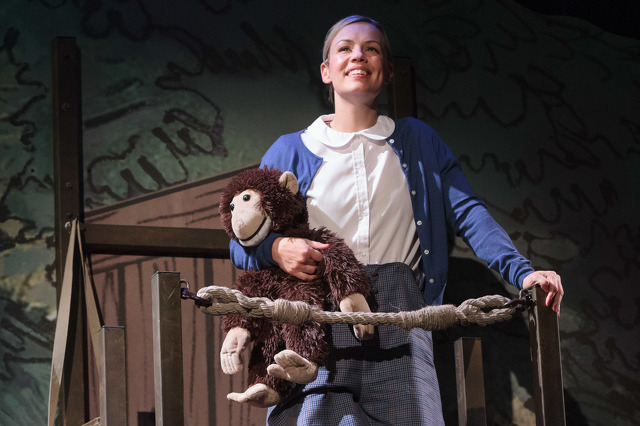 The Kennedy Center Theater for Young Audiences on Tour’s new musical “Me … Jane: The Dreams and Adventures of Young Jane Goodall” comes to Eisenhower Auditorium at Penn State on Sunday, Feb. 10, 2019. Photo by Teresa Wood. A busy weekend of concerts awaits, with singer-songwriter Livingston Taylor, the country-punk of Sarah Shook & The Disarmers, acoustic guitar master Beppe Gambetta, State College Municipal Band and Pennsylvania Chamber Orchestra all performing this weekend. You'll also find theater — like "Me... Jane" at Eisenhower Auditorium — comedy, Valentine's Day-themed activities, sports and a few big annual fundraiser events. This isn't all that's happening, either. There is plenty more around the area for you to enjoy and you can find it all on our calendar page. Explore the weekend's events and add your own if it isn't listed. Or see our Bar Tour and Movies pages for more options this weekend or anytime. Stop by Penn State's Palmer Museum of Art at 12:10 p.m. for a Gallery Talk by Adam Thomas, curator of American Art, on "From the Rooftops: John Sloan and the Art of a New Urban Space." Join the Penn State Social Dance Club from 6 to 9 p.m. at the State College Municipal Building for a special Valentine's dance social. From 6-7 p.m. learn the waltz and chacha then dance the night away to those and other styles taught be the club's instructors. No partner or experience is needed. ClearWater Conservancy’s signature event, the 20th annual Art & Chocolate Winter Galais expected to draw hundreds of guests to the Ramada in State College at 6:30 p.m. for an evening of chocolaty sweetness, and an incredible art auction that sells out each year. The fundraiser helps ClearWater preserve natural spaces, protect and restore resources and connect kids to nature through field trips and hands-on learning experiences. Wise Crackers' comedy season continues at 7 p.m. Friday and Saturday in the Basement Night Spot, 112 W. College Ave. This week features KC Arora, headliner Teddy Smith and MC James Tierney. Tickets are $20. Singer-songwriter and musician Livingston Taylor heads to the State Theatre for an 8 p.m. show. The fourth child in a very musical family, his career has spanned 50 years, sharing the stage with major artists like Joni Mitchell and Fleetwood Mac and developing varied repertoire across a range of genres. From top 40 hit s“I Will Be in Love with You” and “I’ll Come Running,” to “I Can Dream of You” and “Boatman,” the latter two recorded by his brother James Taylor, his creative output has continued unabated through the decades. Women's hockey vs. Robert Morris, 1 p.m., Pegula Ice Arena; men's tennis vs. Charlotte, 4 p.m., Indoor Tennis Center; men's hockey vs. Minnesota, 6 p.m., Pegula Ice Arena. Visit the Palmer Museum of Art from noon to 3 p.m. for a free Family Day. Enjoy brief, family-friendly guided tours and art activities. Programs are ideal for families with children ages 5-11, but all ages are welcome. Explore new heights on a guided tour of "From the Rooftops: John Sloan and the Art of a New Urban Space," then create a picture that imagines a home- and cityscape. From 1 to 4 p.m. Saturday and Sunday at Mount Nittany Vineyard and Winery, 300 Houser Road, Centre Hall, enjoy Mount Nittany’s award-winning wines paired with delicious Asher’s Chocolates. Cost is $9.95 per person; reservations are required. Call the winery at (814) 466-6373. From 3 to 5 p.m. at the Bellefonte YMCA, enjoy a special afternoon of dancing, crafts and sweet treats. Open to all: $8 for members, $12 for nonmembers. The 27th annual WPSU Connoisseur's Dinner & Auction begins with a 6 p.m. reception and silent auction, followed by 7:30 p.m. dinner. This year's dinner features Greek cuisine, hosted by PBS Chef Diane Kochilas. Tickets are $210. Details. An increasingly renowned master of acoustic guitar, Beppe Gambetta brings his unique background as an Italian musician in love with both American roots music as well as the music of his native country to the Center for Well-Being, 123 Mount Nittany Road in Lemont, for a 7:30 p.m. Acoustic Brew Concert. Apollo organization presents a THON benefit concert at 7:30 p.m. at Webster's Bookstore Cafe, 133 E. Beaver Ave. Local musicians come perform in support of pediatric cancer treatment and research. Entrance is $5, with all proceeds benefitting THON. Webster's will donate 15 percent cafe sales. By special request, Lady Grey's Lovelies take you on a journey to experience a taste of Paris’s most iconic cabaret, the Moulin Rouge, at 8 p.m. and 10 p.m. in the State Theatre Attic. This show is restricted to patrons 18 and over due to mature content. Men's lacrosse vs. Robert Morris, 11 a.m.; women's hockey vs. Robert Morris, 1 p.m., Pegula Ice Arena; women's lacrosse vs. Towson, 2 p.m.; men's hockey vs. Minnesota, 6 p.m. The Central PA Bridal Expo returns from noon to 4 p.m. at the Penn Stater, with more than 80 vendors, plus food samples, specials and features throughout the show. Enjoy an afternoon of dancing, crafts, and sweet treats hosted by the State College YMCA at the Ramada Hotel, from 1-3 p.m. $16 per family for members or $20 per family for non-members. Register here. Penn State women's basketball hosts Michigan State at 2 p.m. for the 13th annual Pink Zone game honoring and celebrating breast cancer survivors. The Pennsylvania Chamber Orchestra presents "Bee Is for Bach," at 3 p.m. in the State Theatre. The State College Municipal Band performs its annual Valentine's Day concert, with songs celebrating a "Season of Love," at 3 p.m. at Mount Nittany Middle School. Free, but donations are welcome. Based on the award-winning book, "Me Jane: The Dreams and Adventures of Young Jane Goodall" shares how the young Goodall believed in herself, lived her dreams, and made a difference in the world as a scientist has spent more than half a century studying wild chimpanzees. The Kennedy Center Theater for Young Audience production takes the stage at 4 p.m. in Eisenhower Auditorium. State College Area Roller Derby opens its ninth season at 5 p.m. at Penn Skates, 2210 High Tech Road. Tickets are $8 in advance, $10 at the door and kids 10 and under are admitted for free. 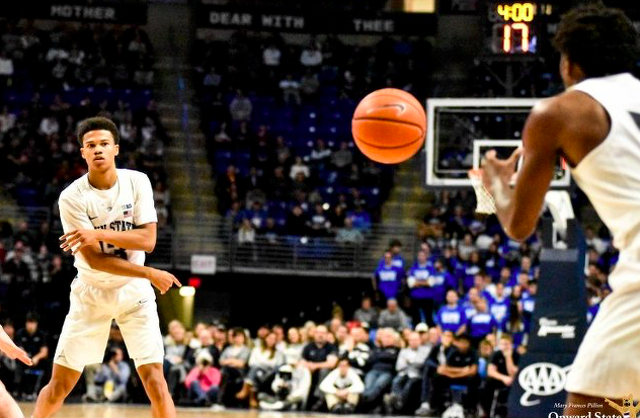 Probably the most confounding thing about Penn State basketball is that the actual solution to "the problem" has become increasingly unclear. In a normal world, Sandy Barbour would almost secretly want Pat Chambers and his team to get blown out every night, to see close losses turn into something a lot easier to diagnose.